Despite its dry, temperate climate, California had more mosquito-borne infections than any U.S. state from 2004 to 2016, according to new data from the U.S. Centers for Disease Control and Prevention. The California numbers are primarily attributable to the state’s large population (more than 39 million) and strong public health reporting system, said Dr. Claire Panosian Dunavan, professor of medicine emeritus/recalled in the division of infectious diseases at the David Geffen School of Medicine at UCLA. California reported 9,254 locally transmitted and travel-related cases, according to state figures. Other states with the highest number of cases were New York (7,167), Texas (6,648), Florida (3,822) and Colorado (2,818). According to the California Department of Public Health, the most common disease-carrying mosquitoes in the state are Culex tarsalis (common name: western encephalitis mosquito); Culex pipiens/ Culex quinquefasciatus (northern/ southern house mosquito); Aedes aegypti (yellow fever mosquito); Aedes albopictus (Asian tiger mosquito); Aedes sierrensis (western tree-hole mosquito); and Anopheles freeborni (western malaria mosquito). Mosquitos typically breed in ponds, agricultural areas, vegetated pools, standing water, tree holes, tires and other containers. Among the diseases they carry are West Nile virus, the St. Louis encephalitis and Western equine encephalitis viruses, malaria, Zika, dengue, chikungunya, and yellow fever. 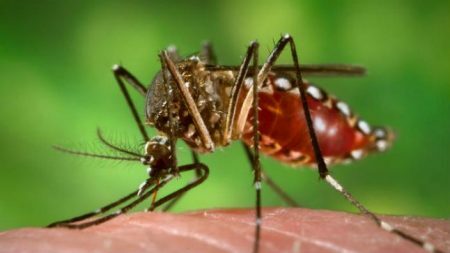 Zika virus, which has been linked to birth defects in newborns, is not a significant risk in California, nor are other tropical diseases such as chikungunya or dengue, which are carried by the Aedes aegypti and albopictus mosquitoes. The Culex mosquitoes carry West Nile. In contrast to other high-population states like Texas and Florida, California spends more on mosquito abatement projects, she noted.